Home » blackberry phones , PlayBook , Skype , Tablets » Skype for BlackBerry PlayBook!! Though there is no official statement yet, RIM will launch Appworld for BlackBerry PlayBook tablet soon, It was at the CES that some people saw demo videos which showed RIM’s official software store, App World, running on the tablet. But the important news is that Skype is going to be a part of the PlayBook although it did not feature in the cluster of third-party apps at the CES. The PlayBook has a 3 megapixel camera capable of high definition capturing on the front and also for video calling. 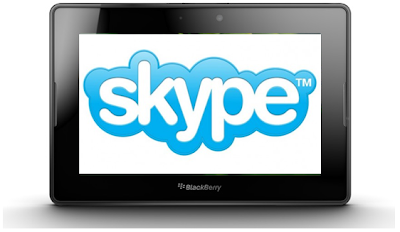 So it is a good news that Skype, the biggest video calling and VoIP service on the planet will be offering its service on this tablet for the users. This device also has a 7 inch 1024x600 display and a 5 megapixel camera, dual core 1 GHz processor and 1GB RAM to handle multiple callers.